The Southeast has an opportunity to capitalize on the green movement, according to a Mississippi State University consumer survey. Richard Harkess, an ornamental horticulture professor in the Department of Plant and Soil Sciences, and Robert Brzuszek, a landscape architecture professor in the Department of Landscape Architecture and Landscape Contracting, wanted to determine if the green movement is influencing the purchase and use of native plants. With support from the Mississippi Agricultural and Forestry Experiment Station, the two professors surveyed landscape architects, plant industry representatives and Master Gardeners in similar climate zones of Mississippi, Alabama, Louisiana, Georgia, South Carolina and east Texas. They hoped to identify people who grew, sold or used native plants and to obtain information on marketing trends that resulted in the sale or use of these materials. "We found there is a lack of knowledge within the nursery industry and among the general public about the availability of native plants," said Harkess. "Some people believe there is a shortage of native plants or the quality is not good, while others have trouble selecting native plants because many of them are not correctly identified." One of the survey questions asked nurseries what percentage of their stock is native plant material. Most nurseries in east Texas said native plants made up between 20 and 40 percent of their stock, while nurseries in the other five states said their plant stock was less than 20 percent native. Interest in using or selling native plants, however, has increased considerably in recent years among the three groups surveyed. "Respondents indicated they had minimal interest in these materials five years ago," Brzuszek said. "There is moderate interest now, which may be a result of the green movement capturing the imagination of the public and the desire of consumers to do more for the environment by using native species in their gardens and landscapes." In 1994, President Bill Clinton signed an executive order requiring landscaping around federal facilities and projects to incorporate native plants when appropriate, practical and beneficial to the environment. 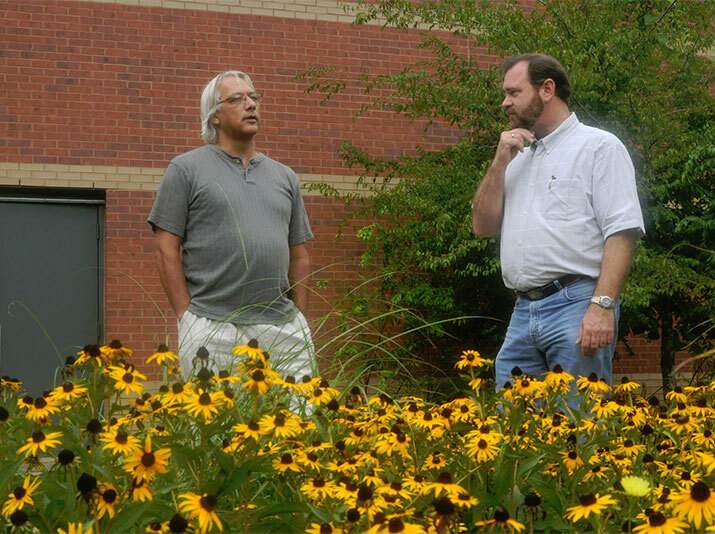 The use of native plants has allowed many federal buildings and projects to meet criteria for certification by the U.S. Green Building Council. The current media spotlight on climactic change, natural resource depletion and environmental contamination has further galvanized the green movement. One of the ways landscape professionals, horticulture producers and gardening enthusiasts feel they can make a positive change is to emphasize the use of indigenous plants. "Native plants have become an important aspect of the green movement," Brzuszek said. "Much of our focus as educators is to teach sustainable landscaping and introduce trends and concepts that our students will use to implement an overall plan." Landscape architects drive the demand for native plants in many areas of the South, according to survey research. These professionals use native plants in urban settings where space, natural resources and maintenance are limited. "Some native plants are more adaptable to harsh site conditions, which makes them the No. 1 reason landscape architects use them," Brzuszek said. "In some instances, the topsoil has been stripped away on commercial or residential sites and few trees may be left standing. The landscape architect has to start from scratch in designing a landscape that works well and meets the desire of clients." Landscape architects indicated on the survey that they tended to use trees such as magnolias and live oaks rather than other types of plants because woody plants are more adaptable to urban environments. MSU Extension Service-trained Master Gardeners use native plants to reflect the character within a residential, commercial or public area. "Master Gardeners said they preferred herbaceous plants such as salvias, butterfly weeds and yellow coneflowers," Harkess said. "Much of their work involves the addition of plants to an established garden or landscape." While the survey reveals a desire for native plants, it does not indicate that natives will displace the use of exotic ornamentals in every instance. "Native plants fill more of a niche market," Harkess said. "Although some wholesale nurseries do focus exclusively on native plants, other types of nursery, greenhouse and grower operations can use this information to expand their business. Availability often comes down to what the consumer is looking for."